Mila took in an evening of youth-made movies last year when she attended the ReelYouth Film Festival in 2006. She brought back a DVD with samples of the movies and we’ll get a chance to watch a few of those at a club meeting. Another festival showcasing the efforts of youth is the BEHIND THE LENS KIDS' FILM FESTIVAL. 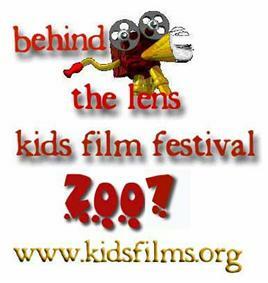 The 4th annual Behind the Lens Kids' Film Festival will be held at the Mary Winspear Centre (2243 Beacon Ave., Sidney, BC) on February 10, 2007 with workshops and screening of films by youths 8 - 18 years old. Sponsored by Narnia™ Productions the www.kidsfilms.org/ website is “…dedicated to budding young filmmakers." Workshops on "Movie Magic", lighting, and movie makeup as well as a session with Lyn Hancock, a well known writer who will be holding a workshop called “Stories Begin in Your Back Yard”. Workshops run from 10am to 4pm. Screening of entries runs from 4 pm to 6 pm with workshop tickets beginning at $20. Want to encourage kids to make movies? Well here are a few opportunities to get involved and see what they are producing and maybe give them some feedback. At the club “Ideas” workshop back in May 2006, the ideas that were passed in mainly consisted of e-mail notes containing jokes or short stories, along with a few typed stories. They provoked some thought, some discussion and a few chuckles. But one thing they all had in common was that they were meant to be ‘read.’ That is, they provided everything that a ‘reader’ needed to understand to a) get the moral of the story or b) the punch line of the joke. But when you are getting ready to tell a story in a movie you need to think about the other language available to you. And that is the language of the silver screen. In the story you tell the reader that the girl is sad. If you do this in the movie, using a voice over, audiences are prepared to accept this information. But if you overuse the voice-over an audience loses interest because they no longer have to get involved in figuring out the story—they just sit back and wait for you to tell them the important bits. Character dialog tells us something about what they are feeling too, but the audience is more engaged, trying to figure out what is happening, why it is happening, and what is going to happen next. And we’ve all seen movies where a character’s gesture, or a glance told the WHOLE STORY, without a word needed to ‘help’ us. Well, back to the idea workshop submissions. Another thing that they all shared was that they were difficult to read. E-mails are notoriously format-challenged, as they add all kinds of distracting lines, broken sentences, blocks of dense text, and weird fonts. Each of the submissions was a ‘gem’ in the rough. Each offered a glimpse of what it could be if it was only taken out of the pile, cut to show it’s best facets, polished, and then placed in a setting to best compliment its colour, and shape. and character dialogue. Translation: Easy to read & understand, and easy for actors to follow their parts and to learn their dialog. I’ve been trying a free ($0) script writing solution, called Celtx, that I would encourage you to check out. It runs on Windows XP, Macintosh OS X, and Linux computers and is yours for the price of a download (http://www.celtx.com/). As an example of what can be done, I took one of the e-mails, that contained a number of jokes involving a minister, and turned it into a short script. Academy award winning? I don’t think so, but it would be a lot easier to get folks involved in the project with the script instead of the e-mail…! If I can I’ll include a printout of the script called “The Minister’s Day”. 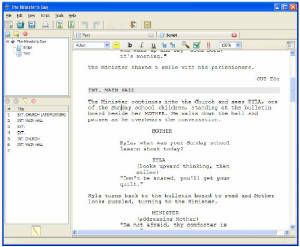 Celtix operates much like a wordprocessor, so it is easy to start using. There are prompts that help you select formatting features, such as to press tab to enter an “action” description, or hit “enter” to write dialogue. And there is room for expansion—when you get comfortable with the basic script features you can explore and have it track props used in various scenes, wardrobe items or cast members, and printout reports. If you are both scriptwriter and director, then you can include camera direction and shot types in the script (a ‘shooting’ script) so when you go into production you have your shot list right there in the script.